Edith of Wessex, sister of King Harold II was the daughter of the powerful Earl Godwine of Wessex and his wife Gytha, the daughter of Thorkell Sprakaleg. Gytha was sister of Ulf, a Danish earl who was King Canute's brother-in-law. Godwin was the son of Wulfnoth Cild, thegn of Sussex, a direct male line descendant of King Alfred the Great's elder brother, Ethelred I. Edith was therefore of mixed Saxon and Danish descent, her father Godwine was a retainer in the entourage of King Ethelred the Unready's son, Athelstan, who rose to power during the reign of King Canute. The young Edith was educated at the royal Abbey of Wilton, where she learned to speak several languages including Latin, French, Danish and Irish. Contemporaries described her as pious, well mannered and adept at embroidery and weaving, she was also accomplished at grammar, rhetoric, arithmetic and astronomy. Edith retained a fondness for Wilton Abbey, and in later years rebuilt its church in stone. 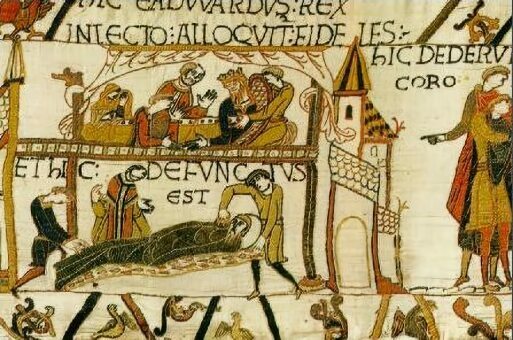 When Harthacnut, the son of King Canute died in 1042, Godwine supported the claim of Ethelred the Redeless' last surviving son Edward the Confessor to the throne. Edward had spent most of the previous thirty years in Normandy. His reign restored the native royal house of Wessex to the throne of England. Edward disliked Earl Godwine due to the latter's involvement in the murder of his brother Alfred the Atheling in 1036, but despite this required Godwin's military support and fidelity and therefore reluctantly agreed to marry his twenty two year old daughter Edith of Wessex. The marriage was celebrated on 23 January 1045. Unlike most wives of the Saxon kings of England in the tenth and eleventh centuries, Edith was crowned queen. Her father and brothers Harold and Tostig Godwineson were banished from England in 1051 by King Edward, he then proceeded to pack off his wife to a nunnery and confiscated all her lands. When the Godwins forcefully effected their return in 1052, Edith was reinstated as Queen. On 15 April 1053 her father Earl Godwine died suddenly, after collapsing during a royal banquet at Winchester. In later years, she and Edward were to become closer, although the marriage produced no children, later chroniclers attributed this to Edward's vow of celibacy, or because he refused to consummate the marriage because of his antipathy to Edith's family. Edith commissioned works for his personal ornament, and had at least one goldsmith among her tenants. On Edward's death, the Domesday Book reveals Edith was the richest woman in England. Edward received his nephew, Edward the Exile to his court in 1057. Edward the Exile was the son of his elder brother, Edmund Ironside, who had grown up in Hungary, where he had been sent during the reign of King Canute. 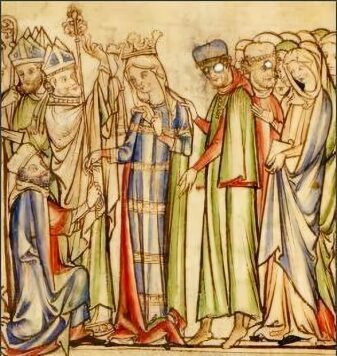 Edward brought his wife Agatha, son Edgar Atheling and his daughters Margaret (later Queen of Scotland through her marriage to Malcolm Canmore) and Christina with him to his uncle's court. The childless Edith adopted Edgar as her son and placed Margaret at Wilton to be educated. Edith was very close to her brother Tostig, and in helped Harold secure his appointment as Earl of Northumbria in 1055. The heavy handed Tostig, however, made an unpopular ruler, he subdued the lawless area of Northumbria by implementing new laws and severely punishing offenders. He imposed heavy taxation and was tyrannical towards those who opposed his rule, his reign in Northumbria was marked by increasing brutality. In 1064 Edith was accused of engineering the murder of the Northumbrian lord Gospatric in her brother's interest. Tostig was most probably hunting in the south with his brother-in-law King Edward when the northerners rebelled and elected Morcar, younger brother of Edwin, Earl of Mercia, as earl. Edward dispatched Harold to suppress the rebellion, however to Edith and Tostig's fury Harold acquiesced to their demands and Morcar was confirmed as earl after which Tostig was forced into exile. Edward the Confessor died on 4 January 1066 and was buried at his foundation of Westminster Abbey, he was succeeded by Edith's brother, Harold Godwinson, who was elected King Harold II by the witan or Anglo-Saxon council. Tostig was killed in rebellion against Harold at the Battle of Stamford Bridge on 25 September 1066 and at the Battle of Hastings which quickly followed on 14 October 1066, Edith lost three more of her remaining brothers Harold II, Gyrth and Leofwine Godwineson. Her brother Wulfnoth, who had been given to Edward the Confessor as a hostage in 1051 and soon afterwards became a prisoner of William the Conqueror, remained in captivity in Normandy. William sent envoys to Winchester to request tribute from Edith to which she complied and thereby retained her estates. Edith was the sole figure among the English royalty to prosper during the reign of the Norman William I. After her husband's death, Edith commissioned a narrative account celebrating her husband's virtuous life called the Vita Ædwardi Regis. She read the lives of English saints, and provided information on the life of St Kenelm to his hagiographer, Goscelin.